Great Sand Dunes National Monument in south-central Colorado contains the largest sand dunes in North America – over 700 ft high. 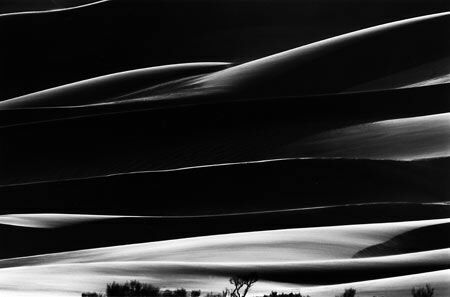 The prevailing west wind has, over eons, pushed the sand dunes up to the face of the Sangre de Cristo Mountains. An eerie river still manages to breach a passage between the mountains and the dunes, and between the river and the mountainside there is enough space for a camping area within the National Park. On my first visit, with the wind blowing, it was not a good locale for a camera. Shooting at sunrise would not give good lighting, for by the time it rose over the eastern peaks and lit the dunes, the light would have been poor. With this in mind, late light and a telephoto lens across the river would fill my 35mm frame with dune. The year was 1990. I was still in my ‘experimental’ period – different films, processes, and printing techniques being explored. At that time, Kodak made available in the US ‘Ektagraphic’ – a 135-36 lith copy film – an high-contrast orthochromatic film. I had learnt that using an ASA of six, and three minutes in Kodalith A + B one would get an image with ‘possibilities.’ This, then, was my choice of film. I shot a roll, exposing for the still lit areas and zoomed in or out as needed. Twelve of the negatives made it. They would be considered over-exposed, and take a long exposure time to print in the mid-tones, but the blacks and the whites stay the same regardless of printing time. That is the film’s beauty, and at six ASA there is no grain at all. I had finally produced the image I had been searching for, for so long - simplicity, minimalism, drama and mystery. This set of images resulted in the end of the experimental period. In my mind, I can’t surpass the effect of these images – they stand alone as a pivotal point for me.